Sergey Luchko, a well-known Russian artist, was born in 1969 in Omsk. Sergey Luchko's works are created in postimpressionism (fauvism) style, strikes the eye with the powerful energy expressed by vivid dab of paint and sharp base drawing. Being mainly the colorist, the artist achieves in his compositions pure sound made of many bright, contrast and simultaneously pure colors. His works, whether it is still-life, or landscape, portrait or simply images — are dancing, verified and negligent, comic and romantic, full of expression and are filled with the special mood and deep philosophical, historical and cultural sense. 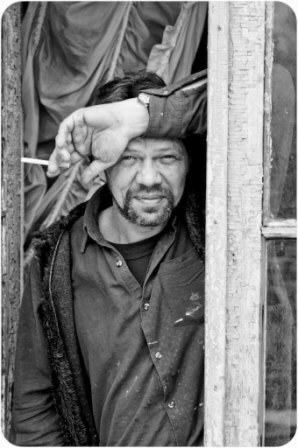 In 1993 he finished Omsk Artistic College №8, Panel Painting faculty. His teachers were V.P.Belousov and A.I.Tchernikov. Till 1995 he studied Graphic Arts at Omsk Pedagogic University. His teachers were S.O.Sochivko and E.N.Tonkih. Sergey Luchko is the Member of the Union of Artists of the Russian Federation, the Member of the International Federation of Artists of UNESCO, the Member of Association of Artists «The Fifth house», the owner of Certificates of Honor of Management of Culture Zhukovsky (2002, 2004, 2010), the Honorable diploma of the Ministry of the Culture of the Government of the Moscow Region. Besides painting since the age of 25 he has been working for the different Moscow theatres: «Under the direction of Gennady Chihacheva», «Russian Style» (art director from 1991 to 1993), «On Taganka», «Russian academic youth theater» (he was S.B.Benedictov`s student), «Arrow» (Zhukovsky, the Moscow region) as a set designer, production designer and art director. He is an art director of more than 10 performances of Russian and foreign classics and modern play wrighting. He performed as an actor of the theatre and movies. - Museum of Modern arts (Omsk) and in private collections in Russia and abroad.